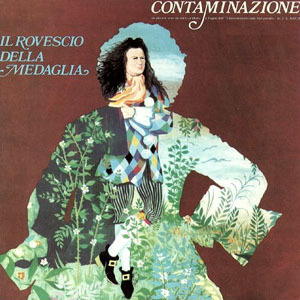 Certainly with this 'Contaminazione' (eng: 'Contamination') Il Rovescio Della Medaglia becomes the protagonist of a series of acute readings of compositions (preludes and fugues) of J.S. Bach, contained in ''Il Clavicembalo ben temprato' (eng: ''The Well-tempered Harpsichord'). The musical style of 'Contaminazione' is an athletic power RPI with Hard Rock parts and melodic parts. More that in emotions (presents) is the technique in first line. Also the recordings and the pruction is good and in my opinion helped the power and the beauty of music. Normally this type of album are not totally good but in this case I think that this album is excellent. I do not have a preferrec song in 'Contaminazione' but 'Cella 503' (eng: 'Cell 503') or 'Alzo Un Muro Elettrico' (eng: 'I Raising An Electric Wall') hit my immagination because they are both great Heavy songs but also 'Lei Sei Tu: Lei' ( eng: 'She Are You: She') captured my immagination with a good melodic athletic and technical RPI. In a certain sense 'Contaminazione' is a summary of the more pure 70's RPI style, with all its facets. And because of this fact I considered 'Contaminazione' a pure masterpiece.